Beautiful, well-covering paints that are great to mix! For painting at home and at school. Not just for kids. The colors are beautifully bright and well-covering. There are boxes with 12 or 24 colors and include a tube of opaque white. 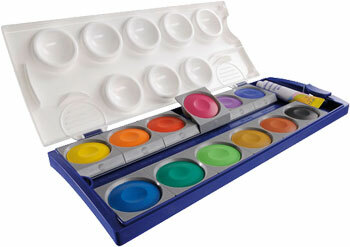 You can mix the paints in the lid and thereby create many new colors. With the extensive accessory, such as the multi-water station and the painting apron, you will have even more fun painting.